Here's something very interesting from my point of view and I'm sure it may at least interest some others. I'm very interested because I was talking to another MSer +Stephen Walton via phone call the other day, we're two old tradies (mechanical, carpentry etc. jack of all trades type of guys) so we have a lot in common. Steve has MS and obviously so do I. Anyway we got on to the subject of the various jobs we have had over the years, the one that got us thinking was that we both did some gardening type jobs where we had used "Glyphosate" or "Roundup" as it's widely known, though it is marketed under many brands and names. 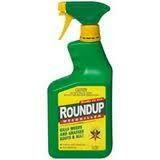 Monsanto make "Roundup". Immediately before I had my first MS exacerbation I had been spraying "Roundup" heavily destroying weeds and basically any living plant life, we were almost drinking the crap we were using it so heavily. This is just before I had my first MS incident and it was the same for Steve. Just now Steve sent me something very interesting, please have a read, it's not that big text wise. Now I'm no scientist or medico, but it has definitely made me take notice, and yes I also run a G+ "Page" called "March against Monsanto" Melbourne, Australia. Just to be honest and to let you know I do despise Monsanto. All that has really done though is make me aware of how evil they are, so I'm interested in what they and their GMOs and Chemicals do to us humans. I have heard about "leaky gut" (you'll see that talked about in the video above) before as a possible cause for MS and many other diseases and problems, but I admit I had fobbed it off, as I don't remember seeing it directly associated with "Glyphosate" so I guess I couldn't see a correlation with my MS, but the first link and 48 page PDF may suggest otherwise and it's science, maybe our western diet is in fact killing us. Of course I'm not positive about any of the above (except my own experiences), but it has got me thinking!